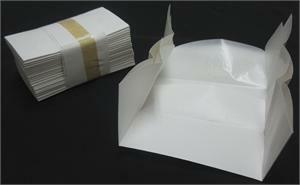 Item #Z-7: Stone Papers with liners for storing gemstones. 100 pieces. Item #OTD-0: Heavy duty 4” wide x 5 3/4” long x 1 1/4” deep Leatherette Presentation Box with velcro attached padded satin lined lid.Comes with eight 1 1/8” round plastic boxes surrounded by soft foam padding. 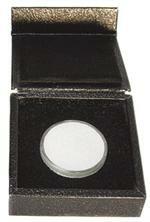 Item #OTD-4S: Leatherette Presentation Box measures 3 3/8" square with a 1 3/16" Round plastic pill box. Item #OTD-4L: Leatherette Presentation Box measures 3 3/8" square with a 1 11/16" Round plastic pill box. Item #OTD-3: 2 5/8” long x 3 1/8” wide x 1 1/4” deep Presentation Box in gray and black suede with fancy white velveteen inside. Velcro sides for a perfect fit on the top. Will hold single stones of 100 Cts.+. May be used without the top for display. 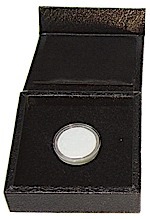 Item #OTD-5: 4” long x 1.6” wide x .9” deep Presentation Box in gray and black suede with fancy white velveteen inside. Velcro sides for a perfect fit on the top. Holds groups of stones. May be used without the top for display. Item #OTD-6: 7.8” long x 1.9” wide x .9” deep Presentation Box in gray and black suede with fancy white velveteen inside. Velcro sides for a perfect fit on the top. Holds groups of stones. May be used without the top for display. Item #Z-8: Stone Papers with liners for storing gemstones. 25 pieces.